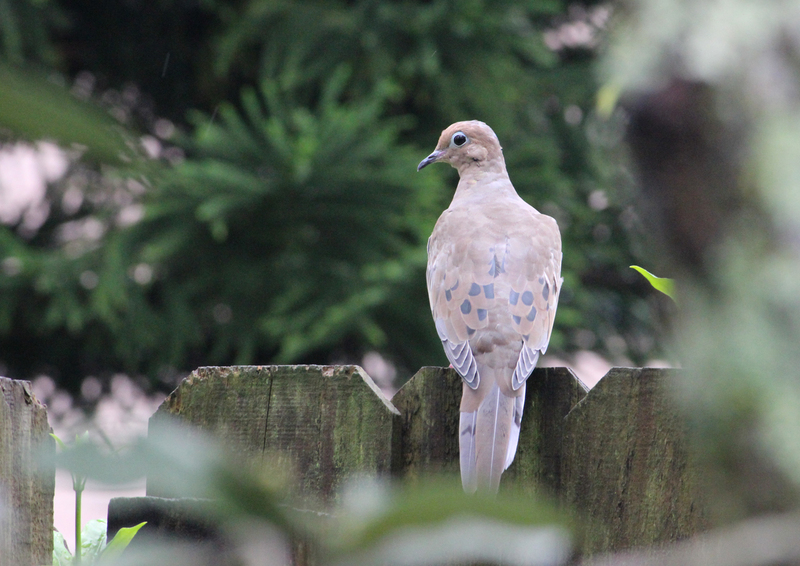 Oviedo, FL: A pair of doves has made our bay tree their part time residence. There’s no nest in it, but apparently it provides enough cover and an adequate view. The skies have been weeping for the past three days, off and on, mostly on. The days gray and humid. When it first started to rain I went outside to check it out. I love weather. As I cast my eyes skyward a little movement in the bay tree caught my attention. 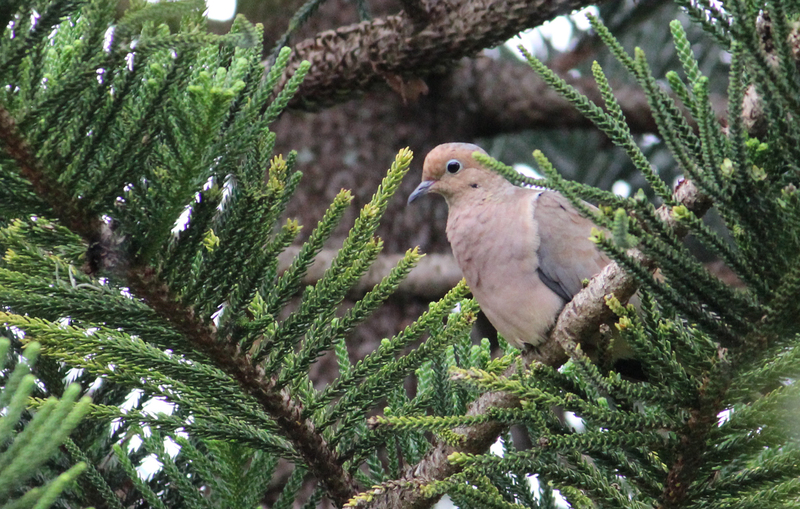 Perched on separate branches were two Mourning Doves. I like to think of them as a couple, choosing each other for reasons only doves can understand. Maybe it’s the way their spots are arranged on their wings, or the prominence of their tail feathers. Whatever the case, they seem inseparable and happily in love. In the orange tree next to them, a male and female cardinal are chirping and hopping around deciding what to do. Cardinal relationships appear to be a bit more contentious. They always seem to be telling the other what to do. Arguing about which tree to nest in and which human has the best bird feed. But travel together, they do, like an old married couple. In the magnolia, a single woodpecker is pacing, anxious that his pecking and foraging will be interrupted. The bark soggy, the sound of his work dulled. Woodpeckers are loners, too cool to be burdened by another. Or maybe too neurotic. It takes someone special to understand them. There they all sit. It’s raining. They’re grounded. Which is only partially true. They can fly in the rain, all of them, they’d just rather not. Unlike humans who force their way through snow storms or drive recklessly in the rain, birds wait it out. They stay for a few minutes, assessing the situation. Recognizing this is no little cloud burst, but a sustained sloppy soaker, it seemed all of them at once began to hop-fly their way from branch to branch, tree to tree; working their way back home. But they’ll all be back. These trees are part of their daily routine. They share them with the occasional blue jay and mocking bird, lots of squirrels, giant grasshoppers and copious lizards. Once in a while a whole family reunion of golden finches shows up to chatter and catch up. The trees that provide shade and food for us, serve the same purpose for them. When the sun pushes the clouds aside and dries up the rain soaked earth, one-by-one, or in many cases two-by-two they come back.